Whoo-hoo! Tied for First Place!!! A huge thank you to all that voted for us in this challenge! Your support means the world to both of us! Whoo-hooo! A brand new year and a brand new Soap Challenge. 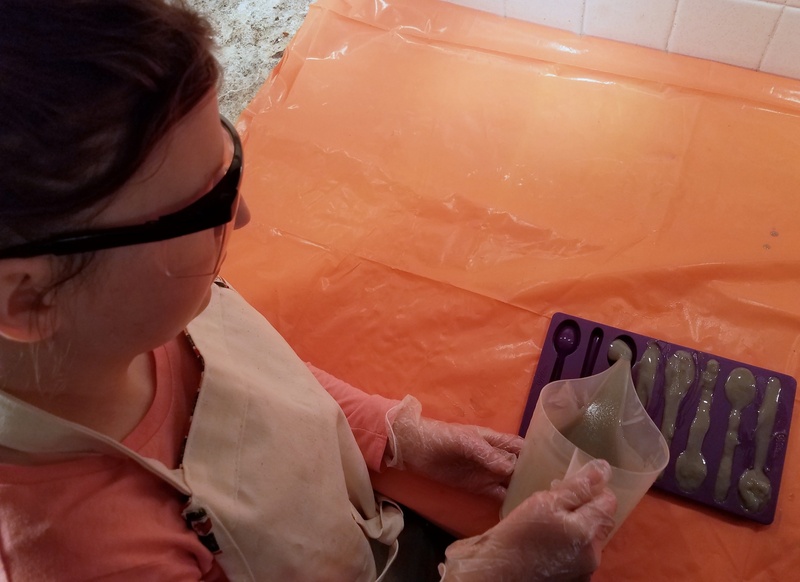 The January 2017 challenge for Amy Warden’s Soap Challenge Club was the Collaborator Challenge. 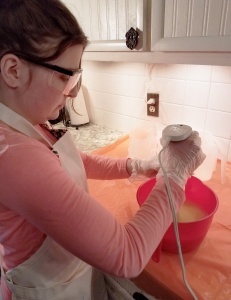 This month we had to grab someone we don’t typically make soap with and, well… make some soap. There weren’t a whole lot of requirements or specific instructions for this particular challenge. 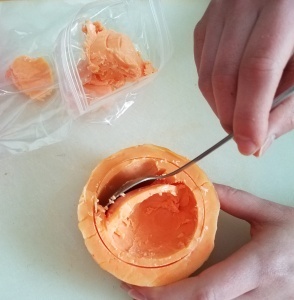 Mainly, our collaborator had to be at least 18 and the soap had to be made with the Cold Process method of soap making. While I would have thoroughly enjoyed working with many of my friends and most of my family, my daughter was the clear choice. She has only made soap once (with my assistance) but she has been my photographer for every one of the challenges I have entered. She’s watched me make a lot of soap. 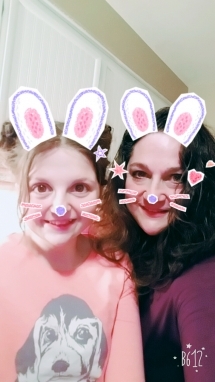 Let me introduce you to my amazing daughter! My beautiful daughter just turned 19. She is the girl part of a boy/girl twin-ship, a senior in high school and is enrolled in a culinary arts program through her school as well. She is also a three-time cancer survivor. Yes, you did read that right. Three times! 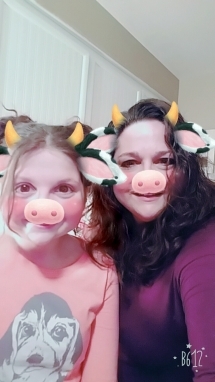 She was first diagnosed when she was only three-and-a-half, was in remission for an entire year, and had it recur in a different part of her body. 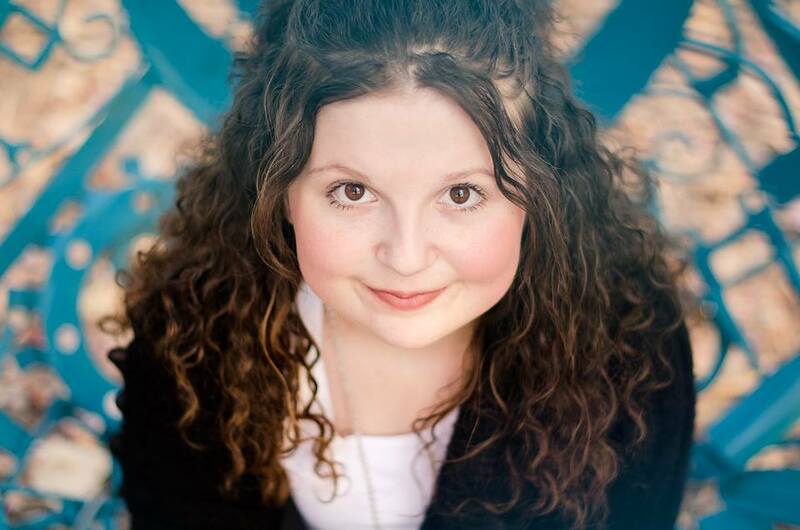 She underwent grueling treatment for 12 months and was cancer free for eight months. She then was diagnosed with an entirely different type of cancer, caused from her treatment from her first two battles. She has officially been cancer free for 12 years! She absolutely loves animals, is one of the most caring people I know, loves to bake, and is very creative in many, many different things. I won’t flood this post with details but if you would like to learn a little more about me and my family, please visit here. I recently had the fortune of being interviewed by the talented Anastasia Krasilnikova (nejen o mýdle) for her “Soapers Around the World” series on her blog. One of the requirements Amy had was for us to post at least one picture of our collaborator either stick-blending the soap or pouring it, and some photos of us working together. 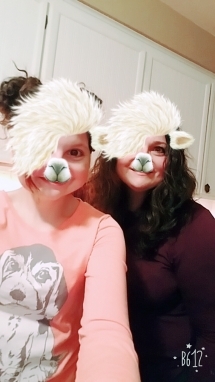 She offered the suggestion of a selfie (or should that be an “us”ie if there are two of us??) in our safety gear. The first day we planned to make soap we had a little too much fun with a new filter app on our phones. We didn’t even get around to making soap that day because we got too carried away! Finally! Now we’re serious…sort of! Immediately after I announced the challenge for this month, Haleigh and I knew exactly what we wanted to do. We have actually been planning this soap since this summer and have just not found the time to actually make it. What a perfect opportunity! Haleigh is always my co-sniffer when I get new fragrances. In fact, I’m not even allowed to open a box if she’s not around to smell the new bounty. I snagged a “Fruity Rings” fragrance oil in a de-stash and once we smelled it, both of our minds started whirling with ideas. It was almost magical! 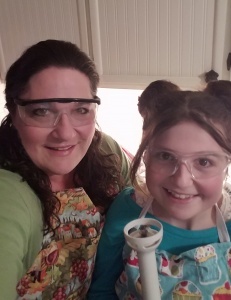 We were like two mad scientists working feverishly to create the perfect soap! 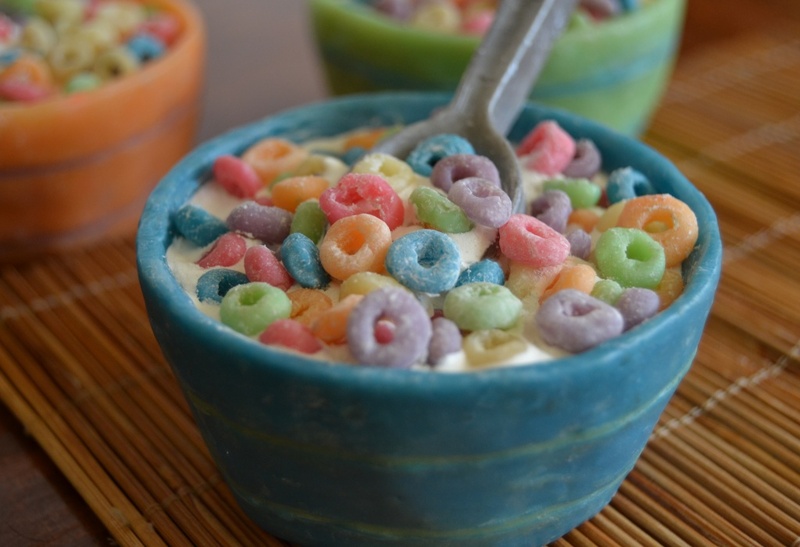 Our final plan was to create bowls filled with Fruit Loops and milk. 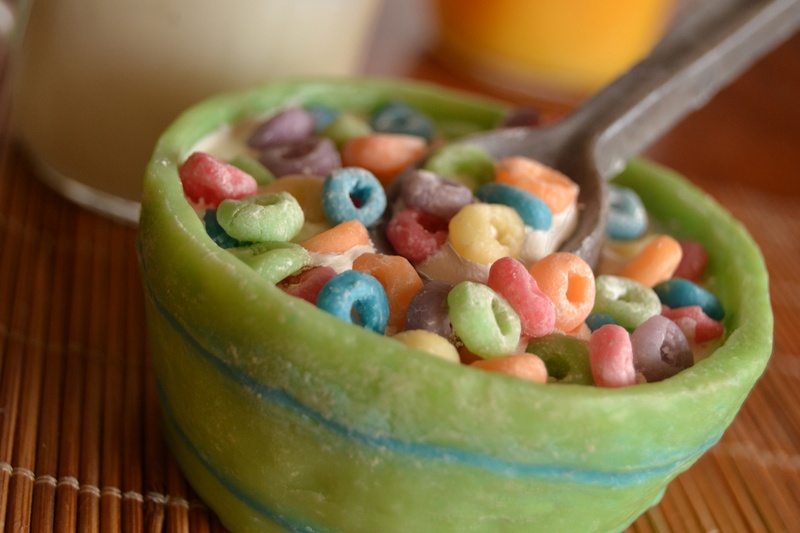 Originally, we had wanted to make molds using real Fruit Loops. 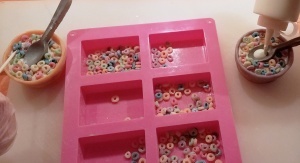 Once we got into the project, we realized the full-sized cereal would look weird in the small bowls we had planned. Soap dough to the rescue! If you haven’t had the opportunity to try this fabulously fun technique, you are truly missing out! 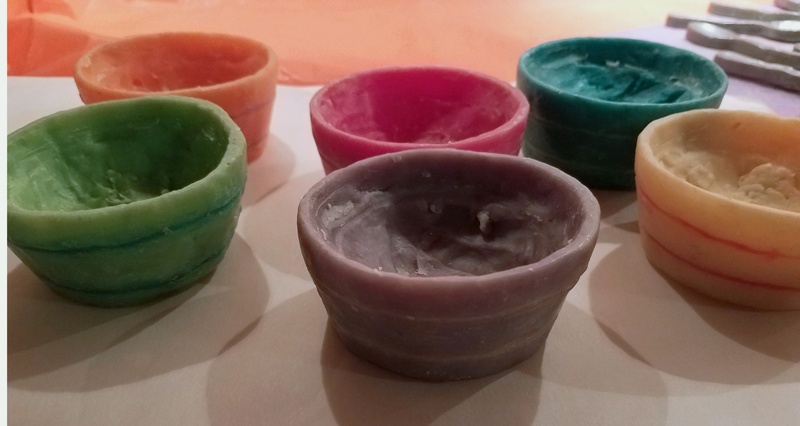 Bee Iyata of Sorcery Soap is the magical witch behind this marvelous idea. 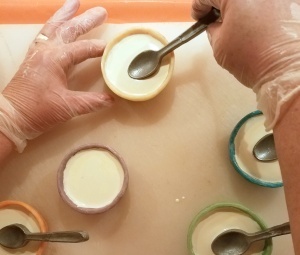 Basically, soap dough is soap made by taking a cold process soap recipe, letting it saponify for 24-48 hours, and then putting it in an air-tight container. Three to five days later the soap can be taken out and molded into anything your mind can think of. Soap dough can be kept in the sealed container for quite a while and still remain pliable. Bee has a posted a basic soap dough recipe on her site and has also released a couple of wonderful eBooks, one with 20 soap dough recipes and another giving some recipes and a more in-depth look at the technique. 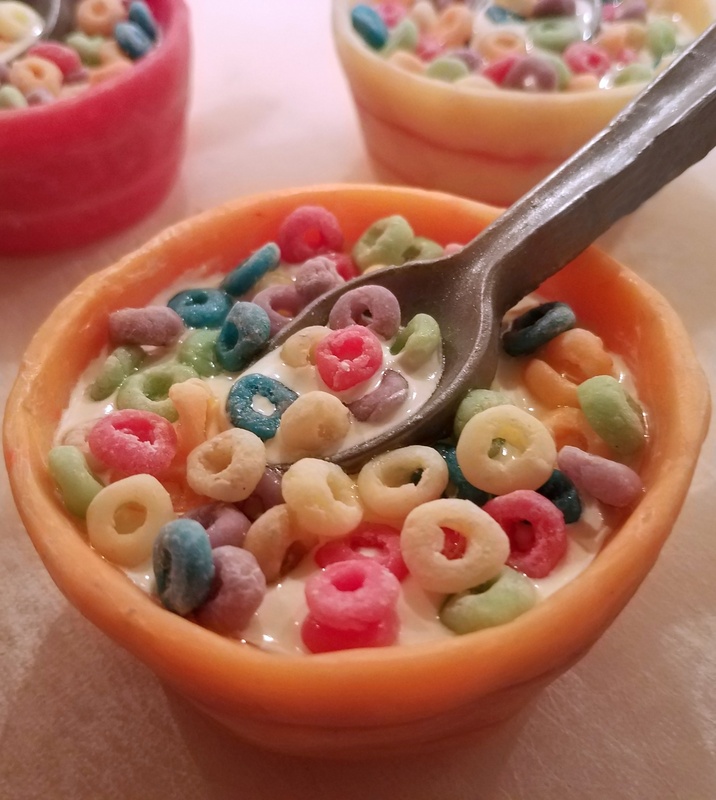 Instead of creating soap dough just to mold the Fruit Loops, we decided to combine a few steps to make the process easier. We were using a silicone muffin pan to make the bowls and knew they would be solid and not very bowl-like. Since there are six colors of Fruit Loops, we decided to make our bowls in all six colors, and scoop out the middles after the soap had set up a little and use the “dough” to make the Fruit Loops. 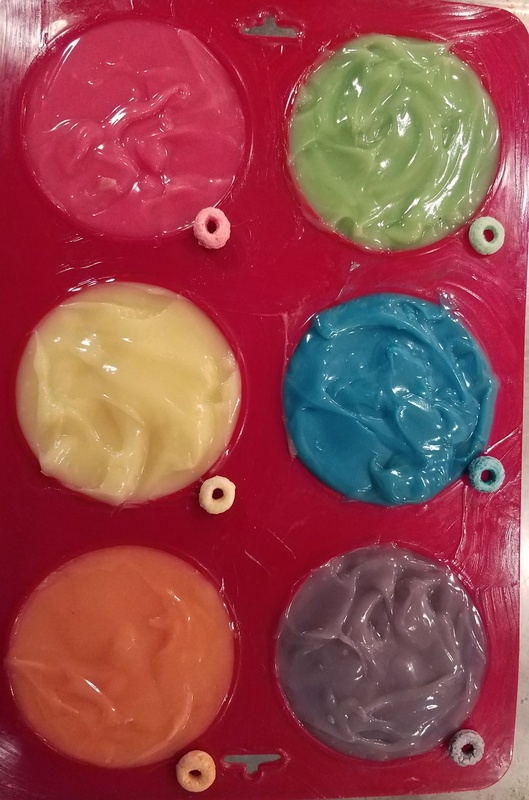 We used one of Bee’s soap dough recipes and filled the muffin pan with the six colors. We made another batch of soap, colored it gray and poured it into the spoon mold. The next day, we scooped out the middles of the “bowls” and put each color into a sealable plastic bag. The bowls continued to cure as they would normally but the soap we put in the bags became our dough. 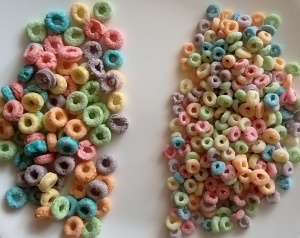 The next phase consisted of making the Fruit Loops. 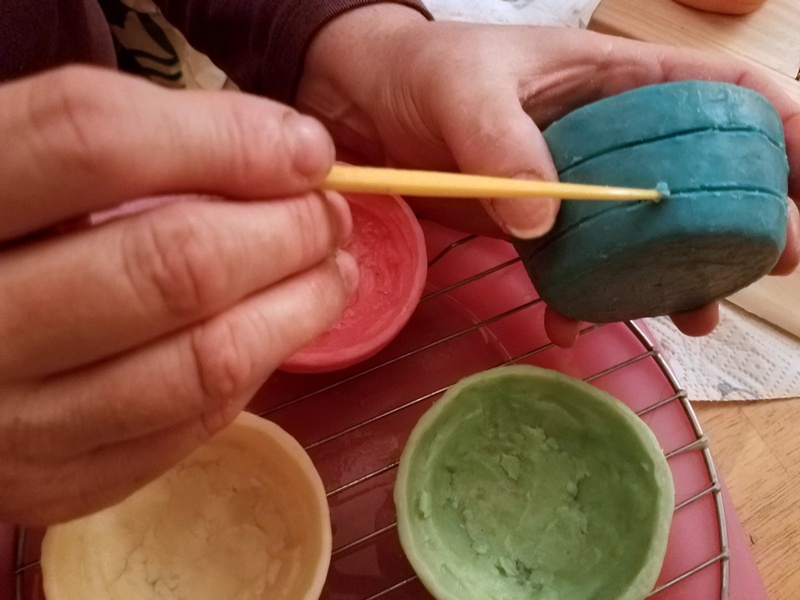 We made them by rolling the soap into a tiny ball and then flattening it slightly. 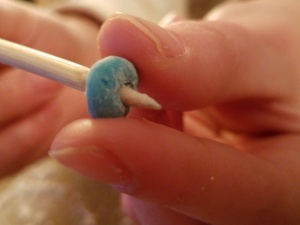 We then created a ring by sticking a bamboo skewer through the middles. We also dipped the little balls in cornstarch not only to keep them from being too sticky but also to give them a realistic finish. 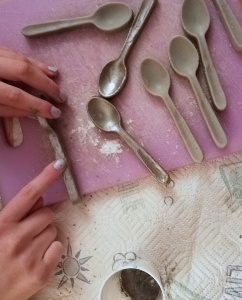 We also removed the spoons from the mold but the handles were a little too long. We ended up cutting a section out of them and re-attaching them together. We then rubbed a silver mica over the surface to give it a metallic look. 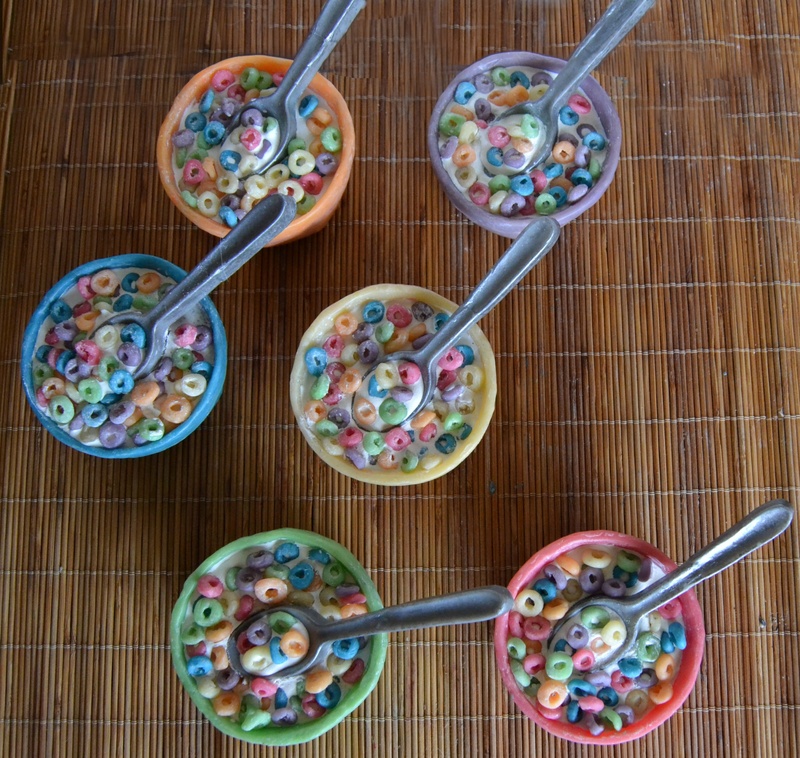 Or next step was to add a little flair to the bowls. We carved a couple of rings around the bowls and then filled each groove with a contrasting soap color. Our final phase was to make a white batter for the milk. 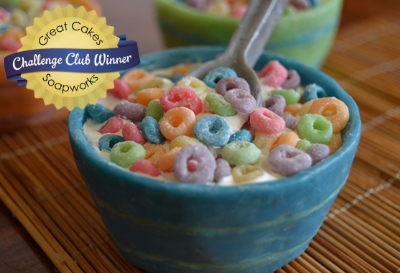 We did end up using a different recipe for this because we wanted the batter to stay thin and smooth. The previous batter thickened up quickly, which was perfectly fine since the consistency was not as important. We poured the batter into each bowl. Once it had thickened up a little, we gently placed the spoon in each bowl and lightly scattered the cereal around in the “milk”, using skewers for more precise placement. We used a squirt bottle to squirt some “milk” in each spoon and delicately placed some loops in each one. We wish the soap could have stayed wet looking like this because it looks so real! We both could not be more pleased with the outcome of our final soap! I think what thrilled me the most is this was a complete and total collaboration. 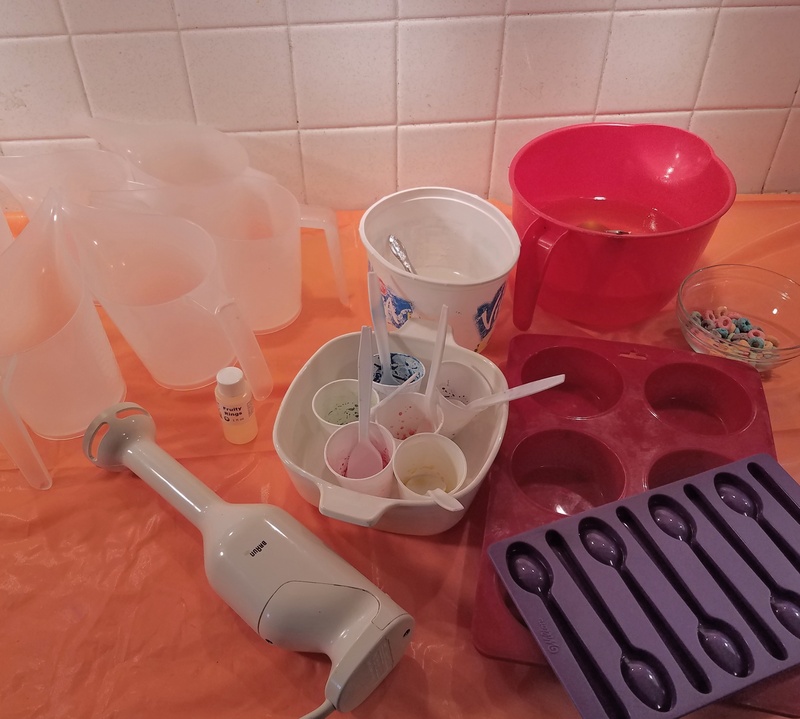 I did most of the set-up and the technical part of the process such as mixing the colors, and setting up the oils and lye, but Haleigh did all the mixing and most of the pouring. We both contributed ideas and solutions equally and we combined efforts putting everything together. This was definitely a team effort! A million thanks, yet again, to Amy Warden and her challenges. Your challenges always push me to challenge my skills and have a way of encouraging me to get things done instead of just putting them on my wish list. This has been such a wonderful experience and definitely created a memory we will always cherish! Thank you, Robyn! It was definitely a lot of fun! Thank you very much, Madhavi! Oh, Claudia! I have missed you! Thank you so much. We had a ton of fun – maybe a little too much fun! And you without a stick blender is an absolute tragedy! I hope to see more of your genius creations soon! These look so amazing! I keep drooling over the soap dough book, I’ve tried the free recipe but keep meaning to play more. This looks like a fun way to play with it! Thank you, Amaryce! I just have her An Enchanted Book of Peculiar Ideas and Soap Potions and love how insightful it is. I am drooling over her big one too, for the organizing. I’ll probably get the soap dough recipe book next. I just can’t stop playing around with the ideas! I love this soap! Like many others, I did a double take when I looked at the photo. It is amazing how real it looks. Very original idea and a lot of processing steps, also a variety of techniques. Thank you for sharing your story and for being an inspiration! Aww, Cheryl! Thank you for your sweet comments! Debi, just wow!!! I love your soap and your whole blog post. As you know I’ve been wanting to try Bee’s soap dough for ages and this really has given me a kick in the bum because of how much absolute fun it looks! It’s just the coolest thing. Thanks for sharing it! And your daughter is gorgeous and such a champion. Oh, goodness, Lisa! You absolutely have to try the dough! It’s amazing how many possibilities it opens up and it is just so much fun. And thank you so very much for your wonderful compliments! You are so kind! Wowza…those are awesome! I have not the patience for something like that. Well done, both of you and what a great way to spend quality time together. Thank you so much! Melissa! It wasn’t too bad since we did it in phases. And you are absolutely right, it was a WONDERFUL opportunity to spend time together! Just truly awesome! 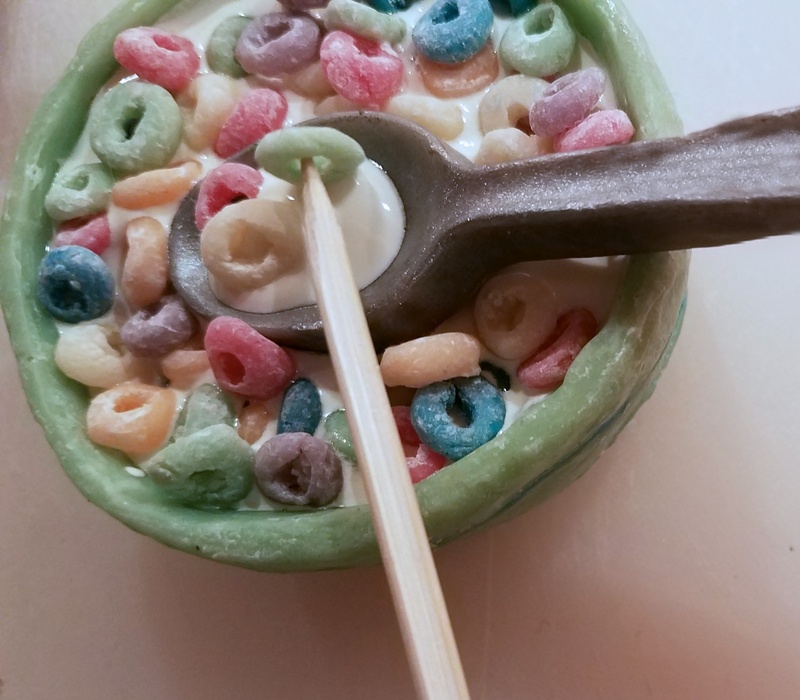 When I first saw it, I had no idea why someone would post their breakfast, then I realized it was made out of SOAP! Very artistic and so much patience. Great job. Lol! That’s the best compliment ever!! Thank you, Melissa! Thank you so much for your sweet comments, Belinda! Awesome!!! Love this idea, really cool! Thank you, Renee! It really was a blast! Amazing! I would never have thought of this idea. Your soap turned out great. Thank you for such kind words, Cindy! It’s amazing what two minds put together can come up with! Such a creative project, and so rich in detail! Inspiring! Thank you for such kind comments! You never cease to blow my mind away!! This is spectacular! My goodness, Carmen! Thank you!!! How great is this? What a fun project for you to share – love it! Thank you so much, Marty! We had a ton of fun! I loved reading all about you and Haleigh making soap – what fun! And SO very creative! 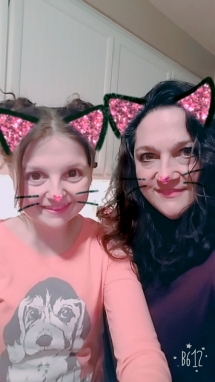 I’m so glad you included a link to the interview you had with Anastasia – it was fantastic and I really enjoyed learning more about you and your life…thanks for sharing that with the world. Good luck on the soap challenge – as always, you nailed it!! Thank you so much, Sly! As always, you are so complimentary and supportive! I look forward to your comments every time! All of these sweet collaboration posts just warm my heart!! You two are just two peas in a pod! 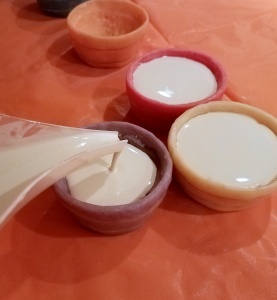 Love the planning and execution of your soap – it’s amazingly realistic and such fun!! Thank you very much, Amy! This was truly one of the funnest and most memorable challenges I have done! Thank you for giving us the wonderful opportunity. Oh my gosh, Debi. These are absolutely amazing!! They look so real!! And the colors are so vibrant. I am in awe!!! Thank you so much, Janelle! It truly was an absolute blast! Lol!! Thank you Shauna! It certainly helped a lot that my daughter was on winter break for most of the production and able to contribute!